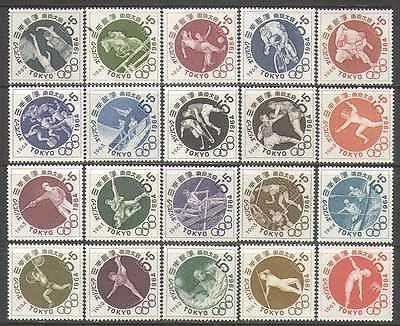 Japan 1961-1964 - "Olympic Games 1964" - 1st, 2nd, 3rd, 4th, 5th and 6th issues 20 value set featuring Football, Canoeing, Fencing, Shooting, Swimming, Weight Lifting, Judo, Water-polo, Horse Jumping, Cycling, Pistol Shooting, Basketball, Fencing, Rowing, Hockey and Gymnastics - in superb u / m (mnh) condition - excellent country, sport, olympics, swimming, soccer, martial arts thematics . If you cannot find the specific stamp set or thematic/topic you are looking for either here in my shop or at the brumstamp stamp shop on eBay http://stores.shop.ebay.co.uk/The-Brumstamp-Stamp-Shop please do nothesitate to contact me. Enjoy browsing and shopping. Andrea!